For this current generation of gifted Spanish passers, their precise position isn’t a major concern. Whereas midfielders who predominantly cross want to be fielded on the side of their stronger foot, and prolific shooters prefer to start on the opposite flank, where they can cut inside, passers are much more adaptable.The quartet of attacking midfielders selected by Spain manager Vicente Del Bosque for last summer’s triumphant Euro 2012 campaign – Andres Iniesta, David Silva, Juan Mata and Santi Cazorla – can play equally well on the left, on the right, and through the middle. By virtue of being amazingly ambidextrous, Cazorla is probably the most versatile of the lot. In his last four matches for Arsenal, he’s been fielded in all three roles, giving Arsène Wenger a wealth of tactical options.Cazorla made his name by drifting inside from the touchline. At Villarreal, where he spent the majority of his career, he played in an unusual system that was 4-4-2 without the ball, but 4-2-2-2 when the Yellow Submarine had possession. Cazorla could start on either flank, but would end up in central playmaking positions, playing passes from that zone without being permanently marked by an opposition holding midfielder.In his sole campaign at Malaga, Cazorla displayed his versatility – initially fielded on the left, he was subsequently used more in central or right-sided roles in Malaga’s 4-2-3-1. The change of position didn’t affect his game. For Spain, meanwhile, his versatility is particularly vital – because Del Bosque has so many other midfield options, Cazorla has to get a game wherever he can. He spent the first 21 games of Arsenal’s league campaign playing between the lines, impressing from the outset. His through-balls towards Arsenal’s wide forwards were consistently dangerous, and Cazorla even managed to pop up in the penalty box for a hat-trick against Reading. But since the start of 2012, Wenger has increasingly experimented with Cazorla in different roles. The 1-0 FA Cup win over Swansea City in the third round replay saw him start wide for the first time in an Arsenal shirt – drifting inside from the left to help create chances. One-nil sounds a close match, but 15 shots on target to Swansea’s one is a neat summary of Arsenal’s dominance, partly because Cazorla became an extra passing option in the centre of the pitch. This also allowed Jack Wilshere to take up a position fitting for the ‘10’ on the back of his shirt, and he was Arsenal’s stand-out player in that role, scoring a late winner. Since then, Cazorla has started on the left a further three times, in the centre three times, and on the right once. He seems to like playing on the left, at least judging by his performances versus Sunderland and Aston Villa – in 1-0 and 2-1 wins, Cazorla has scored all three goals. 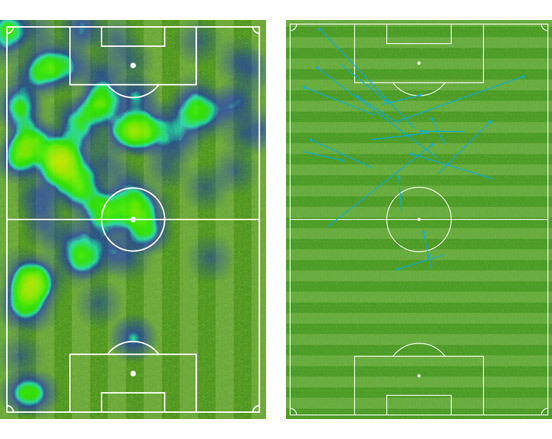 His heatmap from Saturday’s victory (Fig 1) showed how much he loves occupying that inside-left position. It was also notable that Cazorla had six shots on goal from that position, following five against Sunderland – compared to an average of three shots per game this season from central positions (Fig 3, below). The use of two advanced playmakers gives Arsenal great creative options, and Wilshere and Cazorla appear to have a fine understanding. The most frequent passing combination in last Saturday’s game was Wilshere playing the ball to Cazorla on the left (Fig 2, above). “He seems to be comfortable when he plays off the left”, said his midfield colleague and compatriot Mikel Arteta after the weekend win over Villa. Perhaps the final sentence sums up Cazorla’s contribution best. His versatility is useful from week to week, allowing Wenger to vary the shape of the team, but also within matches. Cazorla’s ability to pop up unnoticed in different zones is proving vital, in terms of both creativity and goalscoring. ← Why did we ever doubt you, Jose?